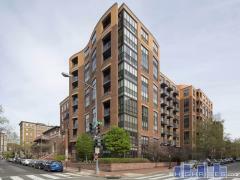 Located on the western edge of DC’s West End neighborhood, 2501 M offers residents the best in modern condo life. Among the features you’ll find in this building (whose homes stretch from 1,000 to 2,300 square feet): oak floors, solar shades, dramatic floor-to-ceiling windows, quartz counters, vanity bathroom sinks, and kitchen islands. LEED-certified, 2501 M offers a variety of amenities for residents to enjoy, including 24/7 staff, a roof terrace perfect for outdoor dinner parties, an on-site gym where you can get in some cardio time, a yoga center where you can re-center yourself after a hectic day at work, a catering kitchen and clubroom for indoor parties and special occasions, and more. Cross nearby Rock Creek and you’ll find yourself among the high-end shops and restaurants of Georgetown (our recommendations: dinner at Bourbon Steak or a sweet treat from Georgetown cupcake enjoyed along the water). Travel a little to the east, and you’ll be in Dupont Circle (we recommend grabbing coffee and pausing to people watch by the circle’s iconic fountain). Have any comments or questions about 2501 M? Ask your question and/or share your thoughts about this Building.